Welcome to Tea Cup Tuesday! Martha and I have been hosting this for over a year now, and we are still having just as much fun as when we first began. We enjoy visiting you all so much, and we appreciate you participating! David Haviland, an American businessman, loved fine porcelain so much he moved to France to create his own company of fine china. This company has now been through four generations and as many of us know, the name Haviland is synonymous with porcelain perfection. David Haviland and his two sons worked to create the famous Haviland company in Limoges. David's nephew Charles came to France to help at the factory, and eventually opened his own factory. He married into one of the oldest porcelain manufacturing families in France. This line of china was known as Ch. Haviland china, and when he retired in 1881, and named Gerard, Dufraisseix and Morel using the mark GDM as partners changed in 1890, and eventually Morel left and Abbot came in. Hence my second cup's backstamp of GMA. Whew! I hope that wasn't too long. 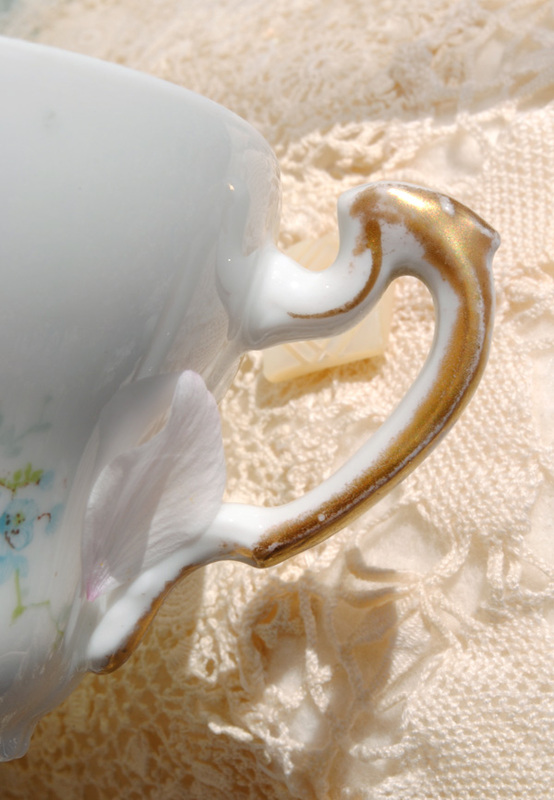 This cup is so lovely, and so delicate...I even think tea tastes better in it! I love the lines in the porcelain and the tiny little feet. It is a very simple design, light blue flowers and wispy sage green leaves. There are simple touches of gold here and there. It has a sweet little handle. 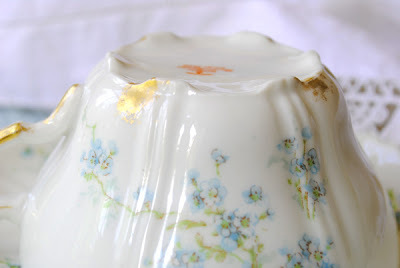 The gold is worn away, which I love, as it makes me think the cup was well used and well loved before I came to have it. The backstamp says "Porcelaine Theodore Haviland Limoges France"
There is an imprint in the porcelain that says "T H" and there is a swirly design around the top. And this imprint was in use from1894-1957. Here is my second cup, made by David's nephew's company Ch Haviland. It is very similar to the first cup. This cup having stronger colors. I love the design impressed into the clay on the lower part of the cup and the plate. Lovely flowers. I think they may be Forget Me Nots.....what do you think? This cup has two backstamps. The circle says Ch.Haviland Limoges and the second one is GDA in script and the word "France" underneath. I had a difficult time finding anything to report on the date of this cup. 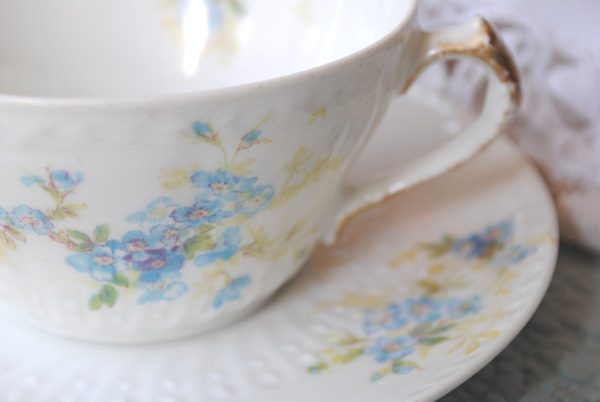 Thank you so much for stopping by today and viewing my tea cups! I hope you are all having a beautiful week. 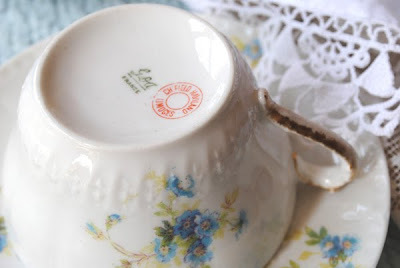 If you would like to join in, just create a post with a tea cup you would like to share with us and then come here to fill in Mr. Linky below. Your link will be automatically created. Check the link out to make sure it goes to your post. If you are participating in the Easter Basket Tea Cup Swap....I hope you are doing well finding a delightful cup for your partner. Baskets should be going out soon if they have not yet. Once you get your basket, it would be lovely if you would create a Tea Cup Tuesday post with it to share with all of us. I can't wait to see what everyone received! and hope to post very soon about it. Both of yor teacups are beautiful but, I have to say, I am in love with the first one! It is so delicate and such beautiful details! I hope you are having a wonderful week Terri! I just love that forget me not cup! Just beautiful! Thanks for hosting today! 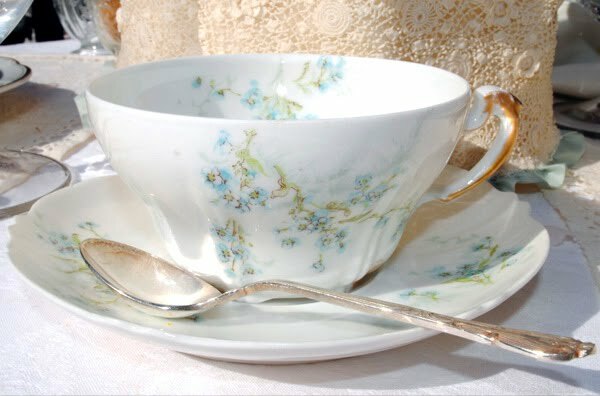 Oh my gosh Terri, this beautiful teacup is my weakness! I have no words to describe the beauty of this cup! love love love the cup so much! thanks for sharing.. have a good day! Both of your teacups are gorgeous. I so love Limoges, in all of it's delicateness. It's just beautiful. Oh I just love your teacup Terri. The soft blue of the forget me not's is so lovely! I also just received a cup similar for my B-day a very special gift! thanks for sharing it today with us! Please come visit me today too! Well I love any color as long as it's blue so that's a special teacup! And Limoges is always special. Have a wonderful Teacup day! I am happy to join this wonderful event again and to see your Haviland cups. It was so interesting to learn about the two families Haviland as I realized that there exist two different companies, but never new exactly why. The cups are both very cute. I agree with you, those flowers are forget me not. Very pretty, thank you so much for sharing. Thank you so much for sharing you exquisite treasures with us - simply beautiful!! You are right, they are very similar and I do think the flowers are Forget-Me-Nots.I enjoy the history lesson too. The first teacup is my favorite and I like the way you think about how much that teacup might have been used and loved by others before you. Thank you and Martha for hosting once again the Tea Cup Tuesday. Your Haviland treasures are very beautiful! Thank you for the highly informative post. 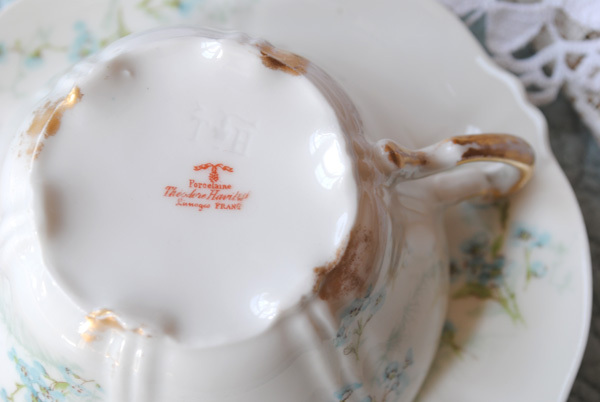 How well you told us about the Havilland family and their porcelain production. Limoges is a mythical name when it comes to porcelain, but when associated with Havilland it reaches the best! So, no wonder your cups are so beautiful and delicate. Thanks for telling us about Haviland. I have a set of Haviland Limoges that is in storage back in Michigan. I hope to get it home to the cottage this year! 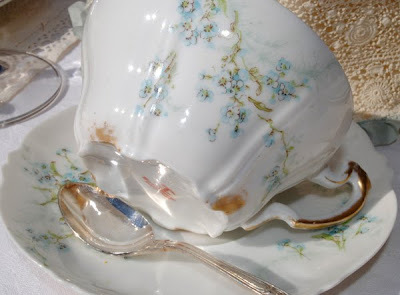 Love the delicate colors in the teacups! I love both your cups but I have to say I'm in love with the first one; simply lovely! I always enjoy the history you share with us on a teacup. The Forget Me Nots are so delicate! Have a lovely day. So so pretty! I love anything with forget me nots on it. Haviland china is just so delicate and beautiful. Gorgious! The foot of the cup is wonderful and I love the soft blue hues. Great selection, thanks for sharing your treasures with us! Yay Terri..lovely..very unique..pure gorgeousness! !Happy Tea Time...beautiful !! beautyful cups! I am sur it is forget me nots,I love those flowers. I am so exited my daughter is going to study and work for a year on the University of Virginia! I will miss her so much, but I am happy for her having this chance!! I love both your tea cup Terri. The colors are so delicate. I love Haviland! This is a beautiful teacup! Thanks for hosting! Oh my, what beautiful teacups. 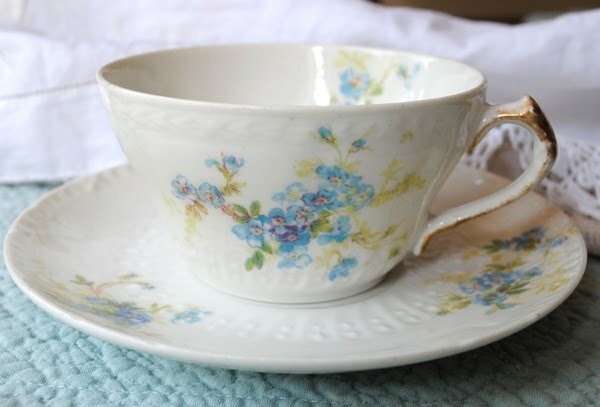 Isn't it amazing how many beautiful teacups are out there. So much loveliness. Thanks for being such a gracious hostess. Terri, both of your cups are simply beautiful. I love the sweet patterns and delicate blue flowers! p.s. my tea cup swap basket is packaged up and ready to mail out this week. Thanks for hosting, this has been a fun swap! They are both so pretty......and will continue to be well used and well loved I'm sure. oh, this cup reminds me of the wonderful little wild flowers that we called May Flowers that grew in the shady part of our yards back East. We would pick little nosegays for our Moms............thank you for a lovely trip back to childhood. 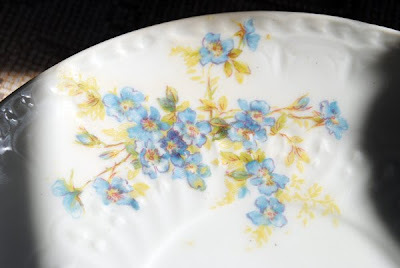 I to have the forget me not Haviland china. The tea cups have a scolloped edge. I have not been able to find any more like these. They have been passed down through the generations. I will be glad to share pictures.